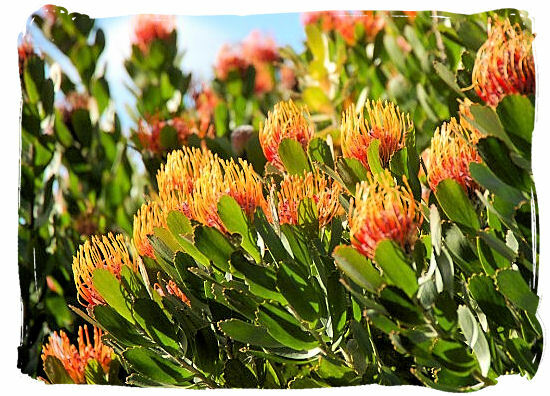 One of the many "must see" attractions around Cape Town is a visit to the Kirstenbosch Botanical Gardens to see the famous Proteas and other indigenous flora of the unique Cape Floral Kingdom. 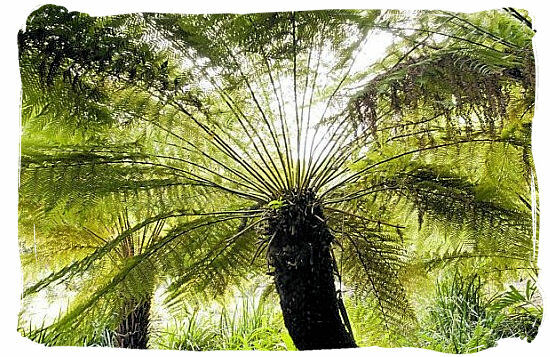 Once part of the property owned by South African mining magnate and businessman Cecil Rhodes (1853-1902), Kirstenbosch is situated in one of the most beautiful locations in the country right at the foot of the eastern slopes of Table Mountain. 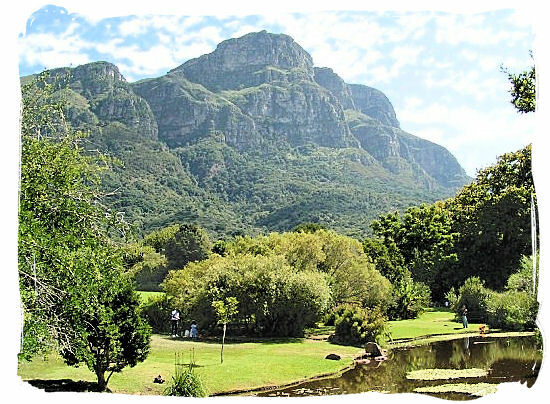 The Kirstenbosch gardens are world renowned for its extensive and unique collection of indigenous South African flora. 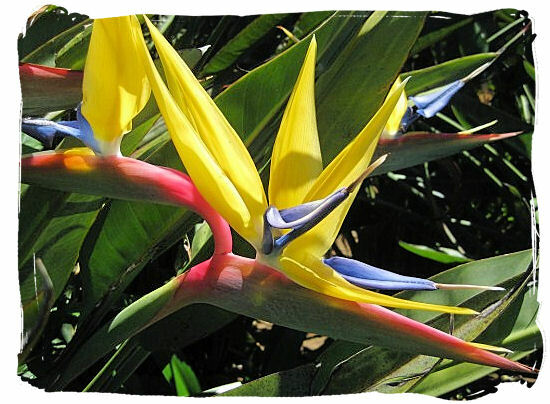 This is all outdoors, comprising a large variety of specimens of the Cape Floral Kingdom together with patches of protected natural forest. Inside the gardens there is also a huge glasshouse Conservatory, which is home to a large variety of exotic plants from different parts of the country. There are three varieties of Fynbos to be found in Kirstenbosch, depending on the type of rock the soil they grow on originates from. Next to some Cape Winelands shale base Fynbos at the north eastern boundary the two more common varieties are the sandstone base Fynbos on the middle to higher parts of the inclines and the granite base Fynbos on the lower parts and in the valleys. Both of them can be distinguished by the presence of dense covers of Erica's and large shrubs such as Proteas and Restios. 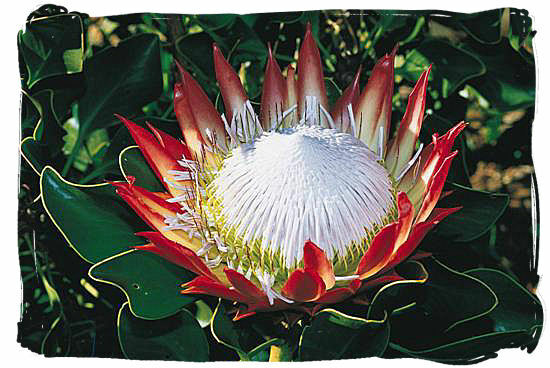 The Protea Family include species like the King Protea (protea cynaroides) which is one of South Africa's national symbols, Green Tree Pincushion (Leucospermum conocarpodendron subsp. viridum), Green Protea (protea coronata), Sugarbush (protea repens), Wagon Tree or Waboom (protea nitida), Silver tree (Leucadendron argenteum) and many more. The Erica's include species such as the Berry Heath (E. Baccans), Rose-pink Heath (E. Phylicifolia), and Erica Hirtiflora, to name but a few. Other heath-like plants include The Cape Gorse (aspalathus astroites), China Flower (Adenandra uniflora)and the Mountain Buchu (Agathosma tabularis) and there are many more. The Restios or Cape reeds, as they are sometimes called, include species such as Thatching Reed or Dakriet (elegia tectorum = chondropetalum tectorum), Rustling Restio or Fluisterriet (elegia racemosa), Square-stem restio (restio quadratus). 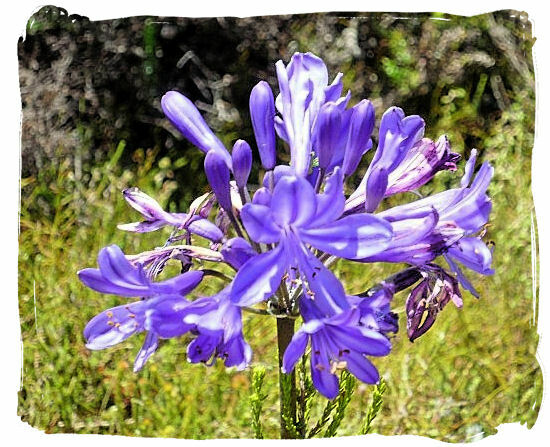 Other Fynbos species at Kirstenbosch include the Cape Agapanthus (agapanthus africanus), Oxalis species such as Wild Sorrel or Suring, Watsonia or Kaneelpypie, Hooded Pelargonium (pelargonium cucullatum), Blue Sage (salvia africana-caerulea), Cape Snowdrop (Crassula capensis), Red Crassula (crassula coccinea) and many others. 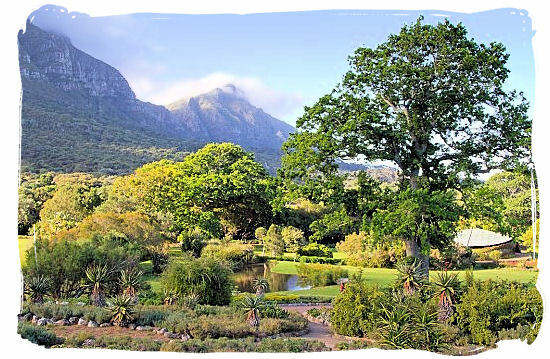 The patches of protected natural forest in Kirstenbosch Gardens is in fact indigenous Afromontane Forest, referring to the mountain forests found in isolated pockets all over of Africa. Species to be found in the Gardens are the Real Yellowwood (podocarpus latifolius), Stinkwood (ocotea bullata), Hard Pear (olinia ventosa), Red Alder or Rooiels (Cunonia capensis), Cape Beech (rapanea melanophloeos). 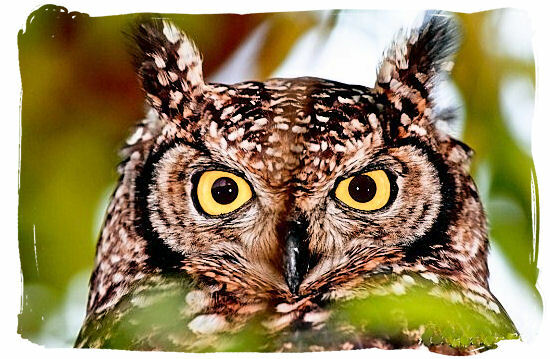 Although you do not often see them because they are active at night and hide during the day, there are numerous animals in and around Kirstenbosch. 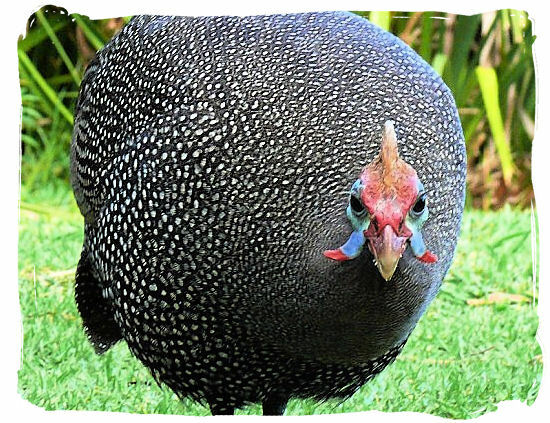 Like for example the Cape clawless otter (aonyx capensis), Water mongoose (atilax paludinosus), Cape porcupine (hystrix africaeaustralis), Cape fox (vulpes chama), Small spotted genet (genetta genetta), Caracal/Rooikat (felis caracal), Grysbok (raphicerus melanotis) and others. 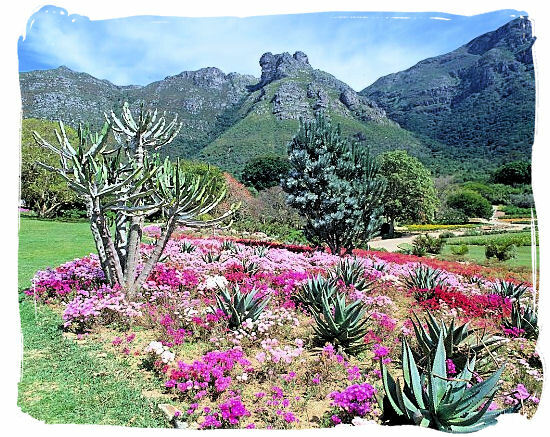 Those who love gardening and gardens could easily take days to take in all that the 36 cultivated hectares of Kirstenbosch gardens have to offer. The gardens are at its most beautiful during springtime, which is from August to October. There is a restaurant where you can enjoy good food and wine, or you can just enjoy a picnic on one of the beautiful lawns. 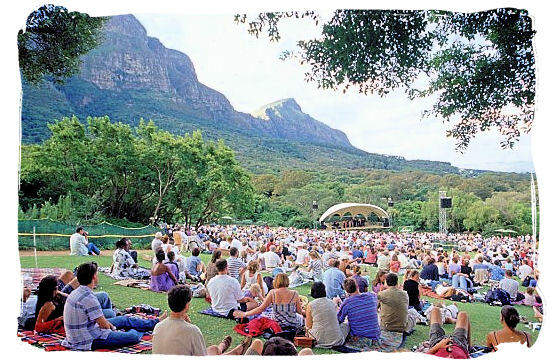 During the summer Kirstenbosch offers open-air concerts on Sunday evenings, which are very popular with the local Capetonians. Just bring a blanket and picnic basket. Kirstenbosch National Botanic Gardens have the following variety of classy venues available for events such as exhibitions, concerts, weddings and many others. The Concert Area where the Summer Sunset Concerts are held with a stunning view of Table Mountain in the background. The Lecture Hall where many horticultural events are hosted. Glasshouse conservatory a venue with a difference for small functions such as cocktail parties etc. Old Mutual Conference and Exhibition Centre Ideal location for corporate functions, weddings, banquets, product launches, workshops, exhibitions and conferences. Marquee Lawn Ideal for large dinners and functions with fantastic views. Silver Tree Restaurant great venue for weddings.